The adoption of the UN Declaration on the Rights of Peasants and Other People Working in Rural Areas by the UN Human Rights Council (HRC) in its 39th session on 28th of September 2018 is a fundamental step towards addressing discrimination and re-emphasizing the obligation of the state in this international norm. It is, then, the task and obligation of the UN General Assembly to endorse the protection of the livelihoods of peasants and all small food producers feeding the world. Small-scale peasants are increasingly at risk and are often victims of forced evictions, violence and harassment. Existing legal instruments worldwide are scattered in various texts, out of reach for the population concerned, and fail to protect peasants and rural workers from on-going systematic discrimination and abuses, with rural women particularly affected. Thus, greater recognition and protection of their rights is a pressing issue. Addressing this is precisely the goal of the long process towards a UN Declaration on the rights of peasants and other people working in rural areas: creating an international human rights instrument, improving the promotion and protection of their rights and drawing attention to the threats and discrimination suffered by peasants and people involved in small-scale food production across the world. 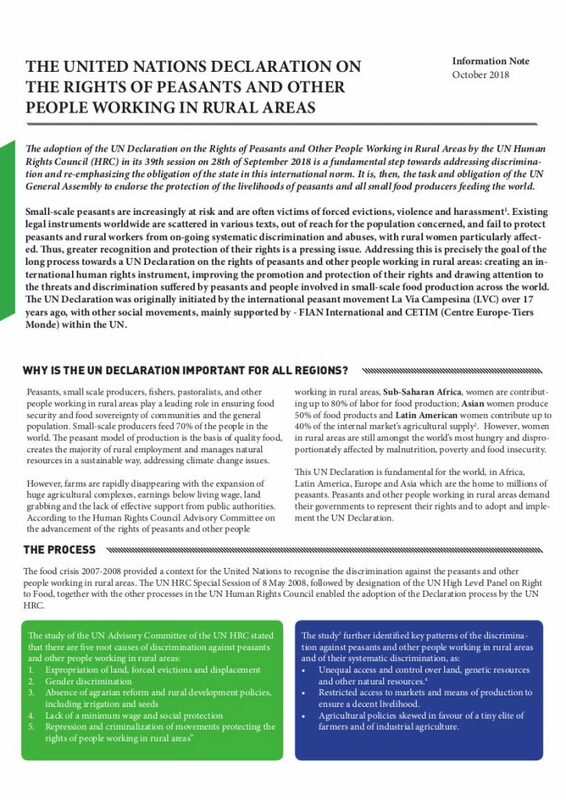 The UN Declaration was originally initiated by the international peasant movement La Vía Campesina (LVC) over 17 years ago, with other social movements, mainly supported by – FIAN International and CETIM (Centre Europe-Tiers Monde) within the UN.